OK The Nordstrom Sale is reaching it's final days. If you didn't already read my post about it here, I went through each and every sale page to bring you the BEST picks. Those needles in the hay-sack, you know!? Bad news: some of you missed out on the GOOD stuff. ...GOOD NEWS AGAIN: heres your chance to redeem yourself and avoid that dreaded "what could have been" scenario. There are still a TON of amazing products that are significantly discounted... that will be going BACK to original price in just a few short days. THIS IS THE TIME to stock up on year-round closet staples like a genuine leather jackets, quality solid color tee's, simple denim, workout leggings, sneakers, BOOTS. Here are a few of my fav picks I felt like I had to highlight. Notice that there is no silver or gold colored zippers or accents!? This is what you want when you're splurging on a genuine leather jacket!!! Why? Neutral, neutral, neutral. This jacket is as versatile as it gets, and you'll wear this for YEARS to come. 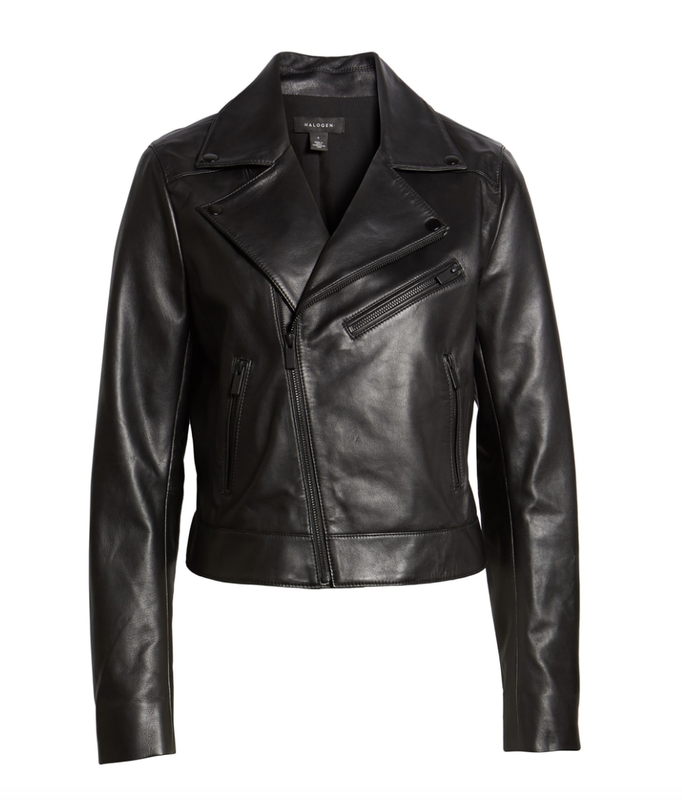 Not ready to splurge on a genuine leather jacket just yet? That's ok! Here's a more budget friendly (faux) option. Still a GREAT addition to your wardrobe. Remember how I said SOLID colored tops are the way to go because VERSATILE and year-round. Who WOULDN'T get use out of this cream colored pullover Free People sweater!? I personally own about 5 sweaters from Free People and they are hands down the best investment in my wardrobe. I wear them ALL the time. I'm genuinely shocked they still have a few of these in stock. So unfortunately a lot of the sizes are sold out... however if you are a Medium or XL, YOU'RE IN LUCK! I LOVE a good faux leather legging, and let me tell you... SPANX knows what they are doing as far as fit, style and comfort. How BA are these!? They kinda look like the Ferrari of leggings. THE SIMPLE V-NECK TEE: WAS $17, now $11. That's right, $11. This is the perfect tee to style in a million and one different ways! How pretty is this sleep shirt!? Perfect for those cold winter nights! Are you picking up on my solid-color neutral tendencies yet??? I honestly never knew I needed a metallic ran coat until I laid eyes on a metallic rain coat. DROOL. Rain coats aren't typically something we THINK to buy, but I know that I always wish I had one on those cold, misty days. This one comes in black, but I'm personally going for the pink. (pink'ISH, more like a tan). So I used to be a clarisonic kinda girl, but honestly I would get annoyed with having to change out the brush heads so often. I felt like I could NEVER get them fully clean. However I then came across the Foreo Luna and just like that I have a new favorite facial cleansing gadget. And just a friendly PSA: don't forget this sale ends in a few shorts days... and all these prices will go back UP to original price on August 6th!